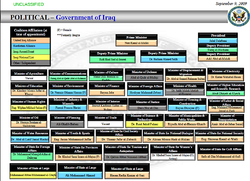 ^ Constitution of Iraq, Section 3, Chapter 1, Article 48. ^ a b "UN urges Iraq to pass oil and gas law". Al-Akhbar. AFP. 13 August 2012. Kobler listed his two other priorities as the selection of a new electoral commission to organize provincial elections planned for next year, and the creation of an upper chamber of parliament, known as the federation council, which is referred to in Iraq's constitution but has not yet been implemented. ^ Sadah, Ali Abel (18 February 2013). "Iraqi Judicial Reforms Include Removal of Chief Justice". Al-Monitor.